The Sri Lanka Sustainable Energy Authority (SLSEA) is the apex institute under the Power and Energy Ministry with a mandate to improve energy efficiency in the country and increase the share of renewable energy resources. The "Mahinda Chinthanaya - The Way Forward" envisions a day where Sri Lanka would be "The Energy Hub of South Asia". Much activity is taking place in the energy field in a bid to realise this goal. Sri Lanka Sustainable Energy Authority (SLSEA), Chairman, Dr. Krishan Deheragoda was interviewed by Daily News Business to discuss the development of renewable energies in realising this goal. Q: What's the mandate given to your organisation by the Government to develop renewable energy? A: The SLSEA was established in October 2007 by enacting the Sri Lanka Sustainable Energy Authority Act No 35 of 2007. Our vision is to create an Energy Secure Sri Lanka. Our mission is to guide the nation and all its efforts to develop indigenous energy resources and conserve energy resources through exploration, facilitation, research and development and knowledge management in the journey of national development, paving the way for Sri Lanka to gain energy security by protecting natural, human and economic wealth by embracing the best sustainability practices. The SLSEA strives to drive Sri Lanka towards a new level of sustainability by improving energy efficiency in the country and increasing the share of indigenous renewable energy resources. We emphasise on reaching energy security at the individual level as well as at the national level. The Government has formulated the National Energy Policies and Strategies of Sri Lanka (2008)which have given us a mandate to increase the share of non-conventional RE resources by 10 percent in 2015 (in power generation). Q: How would you define 'RE resource'? And what do you mean by non-conventional RE resources? A: A renewable energy resource is an energy resource that is constantly replenished. It never runs out of supply. Solar, wind, water, sea waves, geo thermal heat are well known examples for renewable energy resources. When a renewable energy resource originates in our country, we call it an indigenous RE resource. When it originates outside our country, we call it a non-indigenous RE resource. As you already know, Sri Lanka's power sector is heavily dependent on hydro power. We have been developing hydro power since a long time back. All these hydro schemes were major power generation projects and they are also known as 'conventional' power generation schemes since they have been around for quite a long time. Now however, the capacity of such large schemes is nearing their end. Therefore we have to resort to other means of generating power, among which the grid connection of small hydros, wind power generation schemes and solar projects are receiving much attention. Such technologies are termed non-conventional renewable energy (NCRE) technologies, because they were not used in the past in conventional grid power generation. Q: What's the potential of RE resources in Sri Lanka? A: Literally, the potential is unlimited. But practically, the developable potential is limited. For example, the meteorological potential of all promising wind sites in Sri Lanka is a staggering 25,000MW. But due to system absorption limitations, only 200MW of this is feasible to be developed. The annual solar insolation across the country ranges from 4.5-6.0kWh/m2/day, which is more than adequate for applications of solar PV technologies and large scale power generation facilities. The high head hydro sites have been exhausted, but the low head hydro sites, hydropower potential in irrigation channels and drop structures (3-30 m) remain untapped, which promises a potential of about 100MW. Paddy is a main agricultural crop in Sri Lanka. There are over 0.76 million ha of paddy across the country, and additionally, there are over 0.8 million ha of tea, rubber and coconut - which are major export crops, the potential power generation capacity from residue generated from these fields would be substantial. Around 0.72 million ha of marginal land has been deemed suitable for energy plantations, especially for Gliricidia sepium, which can yield 25 tonnes of fuel wood from a hectare. These biomass resources could prove to be the most vital component in meeting NCRE targets, as it offers the luxury of dispatch ability of power as and when demanded. Q: Can you give a forecast for NCRE development in Sri Lanka? We are striving to achieve this goal by 2015. The 'Other' category refers to energy resources like geo thermal heat and sea waves. The cumulative emission reduction from this NCRE initiative is estimated to be 10 million Certified Emission Reduction (CERs) by 2015. Q: How enabling is the business environment for the development of NCRE? A: The NCRE sector has grown over the past 15 years to approx. 185 MW of grid power, generating more than 4 percent of total generation. In addition, 127,000 households have used Solar Home Systems and a further 7,000 have benefitted from off-grid community based mini-grids as of end 2009. We have also introduced a cost based, technology specific, three-tiered tariff has been offered to six genres of technology, viz., biomass, hydro, wind, municipal waste, agro waste and waste heat recovery. Hitherto, we were not in a position to declare a solar tariff due to the high capital costs of solar projects in the world market. But if these prices descend to an affordable level, simultaneously we too could declare a solar tariff in Sri Lanka. The energy purchases are done through an SPPA, an instrument which is time tested and accepted by all stakeholders, which is in operation over the last 12 years. The SPPA has streamlined the power purchasing, wherein the CEB guarantees the purchase of the full quantum of generation and an assurance of a floor price of 90% of the tariff paid in the first year of commercial operation. The CEB has maintained a default free payment culture from 1996 to this date, and has managed to convince all commercial banks of a guaranteed revenue stream from NCRE projects. At present, a transparent resource allocation process has being devised to ensure a level playing field for all RE stakeholders. This process is based on geographical information, which include resource maps, inventories, energy development areas, resource development guidelines, pre and post monitoring mechanisms and well defined approval cycles. This process has been further strengthened through a web based GIS database named EnerGIS, which can be accessed by the public through the SEA website www.energy.gov .lk. Q: Are these developments satisfactory? A : Yes, quite satisfactory. Q: What challenges does the Non Conventional Renewable Energy (NCRE) industry face and how could these be addressed? A: At present, high head hydro is dominant in NCRE development but is reaching exhaustion. Therefore, low head hydro technologies need to be developed, which at present is at its infancy due to the high costs embedded in civil engineering construction works. Although the national grid has extended into many parts of the country, still a considerable number of locations remain un-served by the grid. Over 50 medium to small scale NCRE projects have entered a stalemate due to the inability of accessing the grid. Therefore there is a grave necessity to cluster these projects and construct a common transmission grid to connect these projects to the national grid. The potential in biomass is tremendous. However, the exact figures and statistics of this potential remain unknown. Therefore it is necessary to assess the type of bio resources, their respective quantities and points of origin on an island wide basis. It is also necessary to delineate a supply chain for biomass, identifying all the supply nodes, recipients, establishing retail centres, identifying quantities and respective storage options. This will make the Government's vision of making biomass an industry located in the dry zone. Land issues and conflicting usages of resources need to be addressed. The vast potential in wind remains untapped, mainly due to sub optimal sizing as a result of resource limitations of the private sector. 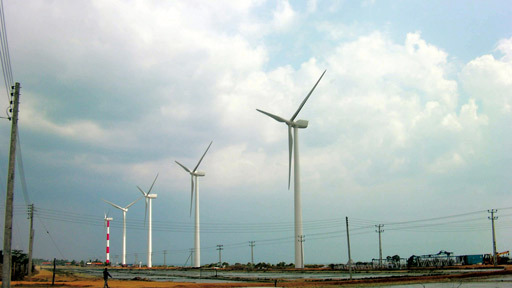 Further, wind development sites in the Northwest of Sri Lanka are in conflict with tourism development and other land use demands, since both developments are competing for the same land resource. Site-specific RE technologies should be introduced to cater to the isolated masses. For example, the remote islands in the North and East could be served by mini-grids running on solar or wind, which are two resources available in plenty in such locations. Certain selected destinations in the country can be developed into RE demonstration centres. The upcoming international airport and seaport in Hambantota have already been identified to be developed into green facilities with the incorporation of site-specific RE technologies, such as solar and Dendro. Smart grid technologies should be introduced to manage wind resources, possibly using advanced forecasting methods and a dedicated wind power dispatch centre. Smart grids are capable of integrating and managing alternative sources efficiently, by dispatching a larger share of intermittent sources such as wind power. On the other hand, the national grid incurs an overall system loss of 15 percent of the electricity generation due to transmission losses and electricity theft. It is vital that these losses be arrested through transmission line and substation upgrades, and by utilising better grid intelligence to arrest electricity theft. Capacity building of local staff and training, especially to the technical staff could provide opportunities to transform the utility perspective of the RE industry to a much favourable one. The transfer of technical know-how, skills and competencies required to increase local value addition in RE technologies need to be vigorously pursued. It is also necessary to encourage local production of RE plant and equipment. Suitable funding mechanisms with appropriate incentive schemes should be in place to mobilise such ventures. Mobilisation of stakeholders at all levels is a must to meet these challenges.